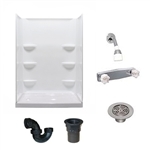 You can now have a complete luxurious mobile home bathtub or shower with matching surround with out the guess work. At Mobile Home Parts Depot, we have put together the most popular bathtubs and matching surrounds taking all the guess work out of making a selection of your new bathtub, shower and surround. You can select a standard mobile home fiberglass tub or even a mobile home garden tub, or change out your standard mobile home bathtub with a new drop in fiberglass shower.